Students in 7th-12th grades have opportunities to meet outside of Sunday morning for the purposes of building spiritual community, leadership development, outreach to the region, and involvement in the Heartland District of the Unitarian Universalist Association, including attending weekend youth conferences in the four-state area of the District (Indiana, Kentucky, Michigan, and Ohio). The Coming of Age program for seventh and eighth graders is a rite of passage that recognizes the transition out of childhood. 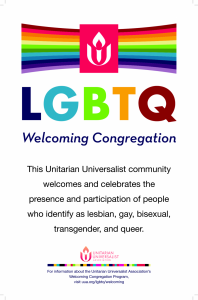 We recognize that, while our youth are not yet adults, they have reached the stage of development where they are thinking and reasoning for themselves, and our part is to facilitate the continuing formation of their religious identity within a Unitarian Universalist framework. The program has four major areas of emphasis: Mentored Learning, Community Service, UU Identity, and Writing an Affirmation Statement. Highlights of the year are a field trip at the end of the school year (for which the group fundraises throughout the program), the Coming of Age Sunday service, and the ceremonial dinner the night before. The Our Whole Lives curricula is based on a philosophy of comprehensive sexuality education designed to help youth make informed and responsible decisions about their sexual behavior. It equips them with accurate, age-appropriate information in six subject areas: human development, relationships, personal skills, sexual behavior, sexual health, and society and culture. Grounded in a holistic view of sexuality, the program helps youth clarify their values, build skills, and understand the physical, spiritual, emotional, social, and political aspects of sexuality. It promotes sexual and emotional health in our communities and fosters meaningful dialogue among peers, partners, families, and friends. The curricula’s approach speaks to the needs of today’s youth and helps prepare them for a meaningful tomorrow. The program is taught by specially trained facilitators. Parent orientation is included.